It is said that when the Greek Goddess Aphrodite walked the earth, she left a bouquet of flowers blossoming in her wake. These are the fragrances that make Oud Bahar. Revel in the top notes of jasmine and rose wood as they caress the fragrance of grapefruit. Find understated splendour in the middle notes of honey and cedarwood. Give in to the sunlight with the base notes of tonka bean and oakmoss. 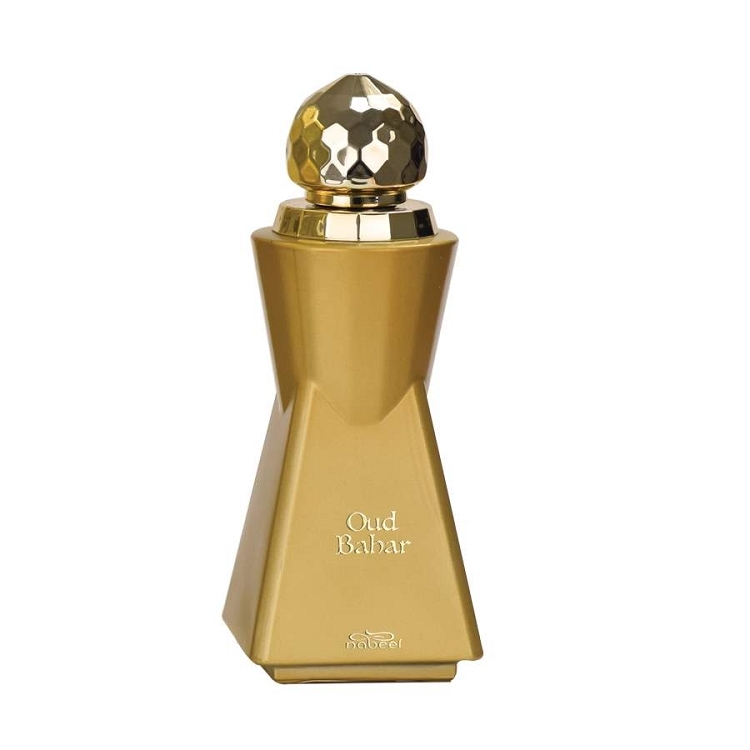 The fragrance is held in a golden bottle, topped with a glimmering golden stopper, and encased in a golden box. As I've sampled several of this particular line from Nabeel, I get the impression that these are all exercises in taking traditional mid-eastern perfumery blends, lightening them considerably, and adding touches of modern western perfumery. I don't know whether this style would appeal to the general mid-eastern market which seems to prefer perfumes with some heft, but I think these are great for anyone looking to "dip their toes in the water", so to speak. Oud Bahar is a "warm", cool-weather blend. The main players to my nose (in disregard of the notes submitted by Nabeel) are myrrh, followed by frankincense, coumarin, sandalwood, and just a touch of both patchouli and an Indian oudh adding a leathery/suede-like effect. This part of the composition reminds me keenly of Bvlgari 'Black', 'Body Kouros' by YSL, and 'Myrrhe Ardente' by Goutal. Hovering and projecting above and beyond this (with cinnamon flickering like an occasional flame from the glowing coals) is a diaphanous layer of iso e super and calone- a very interesting structure, and use of these aromachemicals, I must say! If you can imagine a precious object of gold, covered with a layer of organza, this is my internal image of 'Oudh Bahar'. Quite lovely. My only complaint is that it isn't stronger- though it does have great longevity. And of course the bottle itself is an object of serene beauty.